Led by Dr. Geeta Swamy, Senior Associate Dean for Regulatory Oversight & Research Initiatives in Clinical Research, the DVTU has conducted numerous studies in our maternal/fetal medicine department. Dr. Swamy provides strategic vision and oversight of the regulatory components of the Duke Human Research Protection Program and assists with the development of broad-based research initiatives and other activities to support Duke’s growing clinical research enterprise. Dr. Swamy has dedicated her career to advancing research in women’s health and to mentoring faculty and trainees. She is an internationally recognized clinician-researcher, and an expert and nationally-recognized leader in the field of maternal immunization and vaccination in pregnancy. She currently serves as the Co-Principal Investigator for the NIH-NIAID Vaccine Treatment and Evaluation (VTEU) and CDC-funded Clinical Immunization Safety Assessment, and has published over 100 peer-reviewed manuscripts. 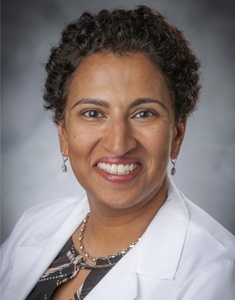 Dr. Swamy has been the Director of the Duke Perinatal Research Center since 2010. Dose Escalation Study to Evaluate the Safety and Pharmacokinetics of NTM-1632: Dr. Swamy and Dr. Vern Juel are leading a study to evaluate NTM-1632 in three dose cohorts (A: 0.033 mg/kg, B: 0.165 mg/kg, and C: 0.33 mg/kg). NTM-1632 is a mixture of three monoclonal antibodies designed to treat botulinum neurotoxin BoNT/B poisoning in adults. Further information about the trial can be found at clinicaltrials.gov. Safety of RIV4 versus IIV4 in Pregnant Women: Dr. Swamy and Dr. Dotters-Katz are leading a study to evaluate the safety of Flublok®, the first recombinant inactivated influenza vaccine (RIV), and Flulaval, quadrivalent-inactivated influenza vaccine (IIV4), in pregnant women. This study will also evaluate adverse outcomes in infants, local and systemic reactogenicity, vaccine-related adverse events and immunogenicity following maternal RIV.